I've been unofficially shooting Bullseye for as long as I've been shooting. Really enjoy trying to be as accurate as possible. This started in the 1980's, and I'm now almost 73. I know that accuracy is by far MOST dependent on the shooter, not the gun, but having a good gun helps. I've now got a Les Baer Premiere II, and a S&W Model 41, and while I'm no expert, I like that the results continue to improve. For reference, at 15 yards I'm typically shooting just under a 3" group with the 45, and a bit better with the 22. 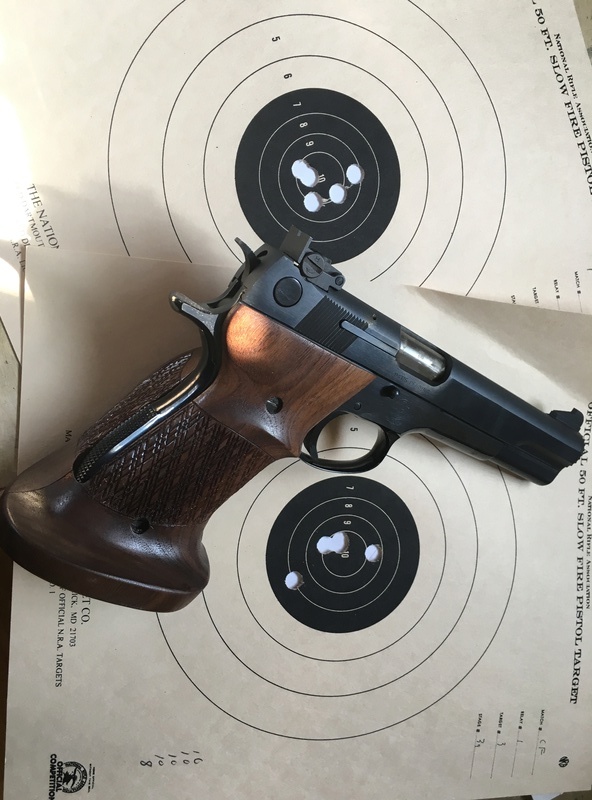 One of the guns I've become very interested in, is a S&W Model 52, and what I've read about it on this forum just reinforces my desire to have one - not to "collect", but to shoot. I can reload, so the precise ammo should be OK, and I realize buying one now means spending between $1200 and $1800. They're findable on Gunbroker, so once I make up my mind, I'm pretty sure I could make this happen. However, here are some things I've been thinking about. I really wanted to get a Colt Python, but found out that there aren't that many people nowadays who are capable of working on that gun, maintaining it properly. That, and there are so many collectors wanting one, that the price seems to be way out of line. I'm not convinced that it would shoot any better than my S&W Model 28, especially with me shooting it. I've read that the Model 52 is similar, in that it is a very unique gun, and if it needs work, that might become a problem. I don't know if parts are readily available, and it might be difficult to find a gunsmith to do the work. So, it's now 2016. I know this gun was specifically made for target shooting, but are there other guns available that are "just as good"? I assume that the bullets that are shot in the Model 52 will work in other guns. The lighter recoil spring can also be replicated. I know it's a very precise gun, with everything maxed out for performance, but is this a difference that an "average" shooter will even notice? To be useful for shooting, not collecting, I know that I need more than one magazine, and the special bushing wrench made for this gun. Are there other things that are necessary, that I don't even know about yet? Having said all the above, is this a gun that I should be trying to buy, or are there better choices now? 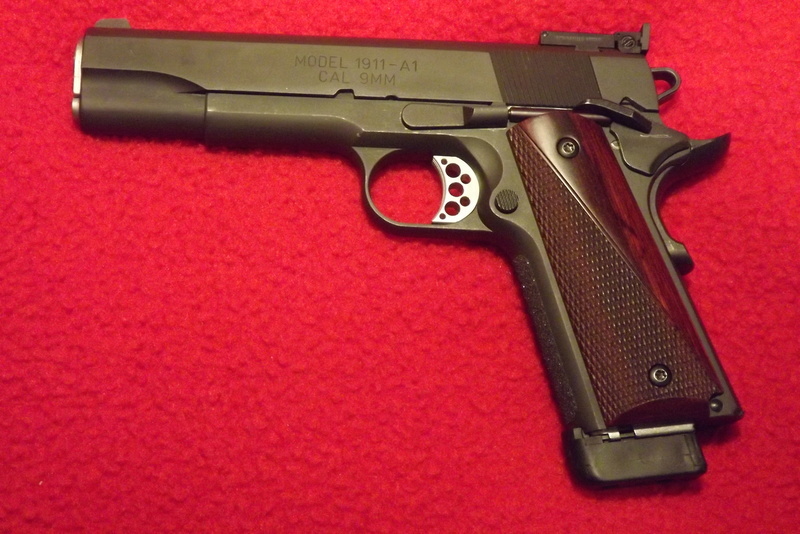 PERHAPS a better choice TODAY might be an all up bullseye 1911 in 38 super shooting near duplicates of the wadcutter. Like a 147 gr SWC cast bullet at 750 FPS. Like you say the 52 is a specialized gun now. There are folks that can work on them but far more are specialists in 1911s. As for revolvers, hard to beat a Python, but the S&W 586 comes real close. if you determined to get a 52 buy a 52-2.. it was the later model and parts are a bit more common.. yes you can "collect" parts for the gun it just takes a while.. I can completely rebuild my wife's 52-1 but boy it took a while to find most of the main parts. I agree the 38 super is great for a centerfire gun.. fairly easy to build or acquire.. A 38 special is another alternative.. If you can find an old Clark then you way ahead of that game.. Most of them will outshoot a 52.. The 52's are fun to shoot. Isn't that why we do it. I have to agree with OldMaster. You specifically said you did not buy the gun to collect but to shoot, however, it's pretty clear in your post that you'd get some enjoyment from owning and shooting this old gun compared to a modern one. You are just unsure as whether to go the "old school" route with the difficulties in parts and expertise vs. the modern equivalent. The "practical side" seems to be favoring the modern equivalent, for valid reasons. As a collector myself, I derive enjoyment from merely handling relics of the past and taking them out to shoot again is a lot of fun for me (in fact, I just shot a two of my FN49 rifles today). In the end, its your money and you should spend it on what will give you the most enjoyment, not what the internet (us included) tell you. If you are merely trying to improve your score, then it seems prudent to reduce the headaches and buy the modern gun. But it sounds like you are trying to justify buying the 52. What you wrote, is exactly what is going on. I decided to forget about the Python, as it's like having a steam powered railway locomotive - the technology to maintain it is being lost as the people who used to know them pass away. I think I feel the way you do, but whatever I get, I really want to use it - probably quite a bit. So yes, your last sentence says it all. I would try to find an "old" .38 conversion preferably by Clark or Giles. Often a Giles conversion is only identified by the sights he used. He made them and stamped them "Giles 45 Shop". These guns will flat shoot and since you already use 1911's it's an easy switch. I have 2 of these guns, a Giles and an unknown. Either will shoot very well and they seem to do it when they get a little "loose" compared to .45's. I bought mine while a .45 only shooter planning to use them after wearing out my arm. I'm your age and my shoulder is "gone" so I've been usin' em for 3 yrs or so. They are fun to shoot!! I have a 52-2 that I use indoors with metallic sights and it is hands down my favorite pistol. I've heard so many people say that they don't group at 50 yards that I haven't really tried it outdoors yet but somebody also told me that Gil Hebard shot some ridiculously small groups with one at 50 yards. As others have said the downsides are parts, and gunsmiths. When I got mine I called S&W to see if they thought I should detail strip it as it's 40+ years old and they very emphatically said to field strip only as they had nobody that could work on it, and no parts. Unless you guys convince me I'm wrong, I'm not concerned with what a gun might do at 50 yards, as mathematically I think I know what a gun might do at any distance, once I get enough results at a different distance. I shoot at 15 yards, and my results were predictable when I shot at 7 or 25 yards. Or maybe I could ask, if on a scale of 1 to 100, and the M-52 was rated at 95, how much less would a new Colt as described in this article compare, ONLY for bullseye shooting, if possible, using the same handloaded ammunition as used with the M-52. Would it rate at least a 90 ? If you decide to go away from beauty, fun and the pleasure of shooting an oldie but goodie then don't bother with a Colt. The best bang for your buck to have another pistol that would shoot 95% (Master scores) is the Springfield Range Officer. Not pretty but everything there to shoot those 95% scores. This is the 9mm RO turned into a 38 super by changing barrels, magazines and the bushing. All for about 1000.00 less then the Colt. Shoot three pistols for BE. I like shooting old pistols that can still perform when I do my part. You're making it very difficult to change my mind from what I think I ought to do. That being the case, then next step might be finding a good M-52, with both magazines and the wrench, in good condition. Better than good condition would be fine - that just means the price goes up, but it would be more likely to be in good shape for shooting. I left a notice asking if anyone had an M-52 who might sell it, at Hollywood Rifle and Pistol Club today - lots of members from a zillion years ago, and Bullseye is a big thing there. I very much enjoy shooting there. It was the club secretary, Linda Dillon, who found me a used Les Baer. (She also helped me get about twice as good (or is that half the group size) from when I first met her. I've learned a huge amount from her, and her feedback. I don't just want a 38, I want a gun that I'm going to want. I don't really "need" one, but ever since I shot my brother's M-52, I've wanted one. OK, questions answered. I guess I'll continue looking for one. Thanks for all the help. Minor detail but try to find magazines with metal followers. I made the mistake of snatching up a 52 mag at a gunshow only to realize it has the plastic follower. There is a difference in reliability! orpheoet wrote: Minor detail but try to find magazines with metal followers. I made the mistake of snatching up a 52 mag at a gunshow only to realize it has the plastic follower. There is a difference in reliability! Does the same magazine fit all three versions of the M-52, or are there differences? Were both of the magazines made by S&W? Which is newest, the meta follower or plastic? Regarding "reliability", are you referring to problems in the part itself, or problems in feeding the bullet into the gun? As far as a special bushing wrench, well, you don't need it. A 12 point 7/8 inch socket fits and works perfectly for removing/replacing the bushing. No socket driver needed and just hand tighten with the fingers and the socket. I have both metal and plastic follower magazines and both types feed reliably in my pistol. Wobbley wrote: I have both metal and plastic follower magazines and both types feed reliably in my pistol. I have metal and plastic follower mags and neither have feed problems. I have found that most feeding problems are related to the ammo, especially how much bullet extends past the brass. Thanks to posting in this forum, a member of the forum is willing to sell me a 52-2. I'm much happier buying from a 'real person'. We will meet up this Friday. Any advice on where to buy commercial ammunition, before I start hand loading? Thanks to everyone for all their advice, and thanks to the forum for my now being able to buy the gun! Factory ammo is scarce. Black hills has some from time to time. Remington shoots best, Federal if you can find it. Winchester is out there somewhere. I've had decent luck with Sellier & Bellot. Magtech functions but doesn't seem to shoot. Fiocchi has function issues with my pistol. Roze Distribution sells Zero 148gr HBWC ammo. I had one box of Zero that had the bullets seated out. I bought it second hand so I'm not sure if it reflects current production. Would not function through the magazine. Shot well tho. Is one of the above preferable to the others? I'll check out the other sources you guys noted.